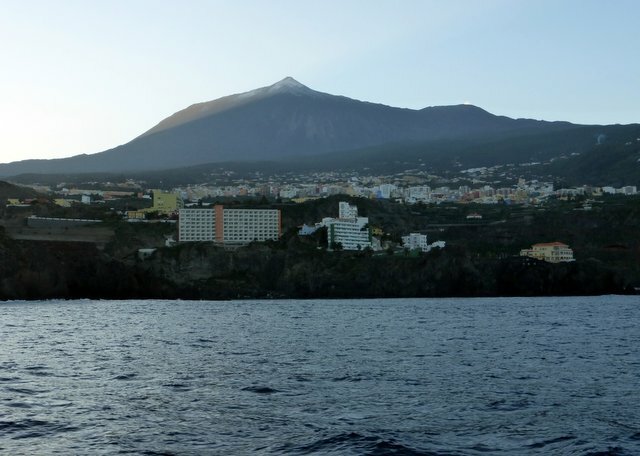 From the island of La Gomera, it’s about 65 miles to Santa Cruz, but M, with characteristic change-of-mind and weary of the beating at south end of Tenerife, took the long way round, up the west coast of Tenerife rather than east coast, an extra 20 miles or so. The west coast of Tenerife is relatively empty and the volcanic landscapes up to Mt Teide are inspiring. Next day, Pepe, a very quick and expert electronic magic man, came aboard and fixed AIS. (In case you’re interested, he deduced it was a contact inside a special multi-wire cable connecting two devices . He reckoned it was too short and under tension; and was something M would never have found, and didn’t have replacement cable anyway). Whilst a longer stay in Santa Cruz was tempting, it was time to get a move on, so, weighed down with fuel, water and food, and with emigration paper from good-natured Port Police (good gracious, paperwork! ), we headed out before dusk. This is M’s biggest ever single-handed trip. It’s about 800 miles to Cape Verde. He has all the concerns he had when leaving Portugal on a long trip a month ago. Sleep? Safety? Sanity? The reality: – sometimes challenging but memorably marvellous. Sleep? An hour or two here and there (not such a big deal for an insomniac who has to get-up-in-the-night quite a lot anyway!) Safety? 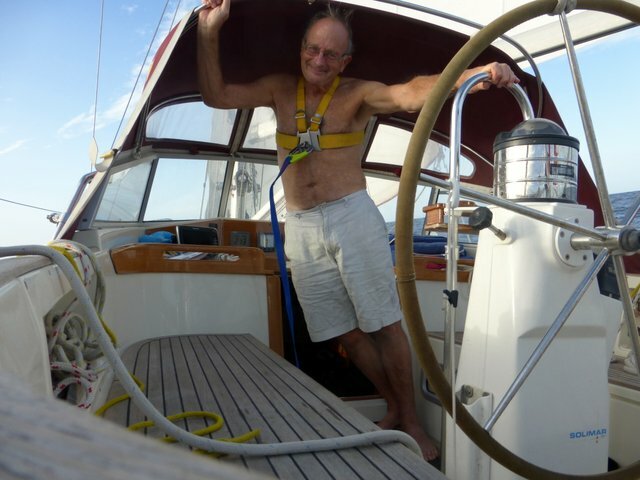 Wear a harness when scampering about on deck (well, not quite scampering….crawling really) and don’t drink (a welcome holiday for the organs of a borderline alcoholic!). Sanity? Of course! You marvel at the magnificence of vast empty powerful ocean. 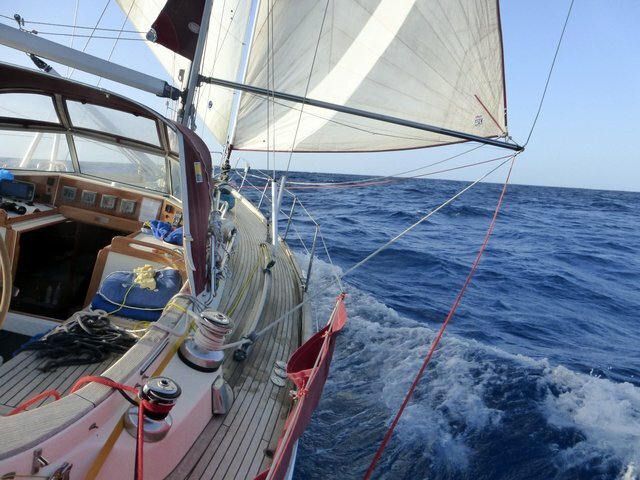 One sailing boat overtook us; it was over 50 ft long, with pink spinnaker up, and the only boat we saw within 20 miles in a week. 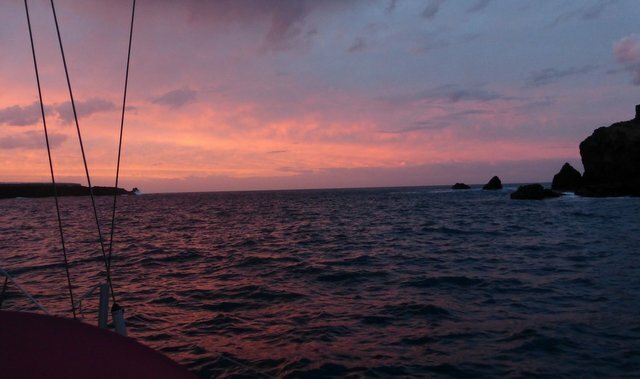 Not wishing to reach our destination in the dark, a sail came down and just a little bit of furled genoa slowed me so we reached Ilha do Sal, at dawn. Ilha do Sal, the pilot book says, is “the most northeasterly of the Cape Verde islands…and covers some 216 sq. km”. 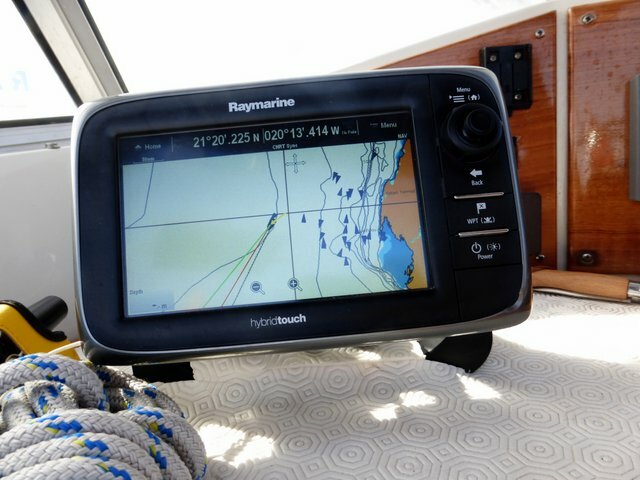 I’d sailed over 800 miles (sometimes quite slowly, as we are still trying new ideas for downwind sailing; and at night, we don’t have too much sail up). The engine was on for less than one hour, just in and out at each end. 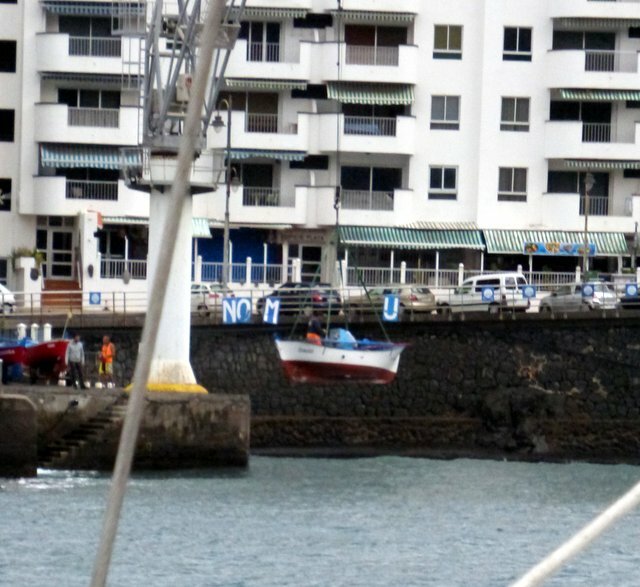 I’m now anchored at Porto da Palmeira, one of the few places in Cape Verde where we have to get inward clearance (coming in your own boat seems more complicated than as an aeroplane passenger). It’s a bit of a one horse town (well, no horse, but lots of skinny exhausted unloved dogs, heads down and dejected, slumped around in African dust). Helpful boatman and general assitant, Jay, welcomed me in his inflatable (M communicates in appalling schoolboy French) and Jay points out where to anchor, then sells bread, suggests where to go and what to do…..more about Cape Verde next time…. 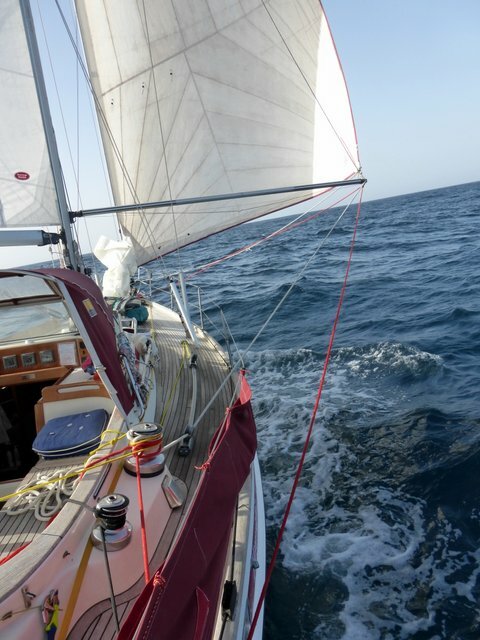 This entry was posted in 2015 England to Cape Verde, Older Posts on 13 December 2015 by michaelsweet50.